I wrote this profile as the final longform story in my Reporting Sports class in 2014. Chuck Culpepper is a gay American sports writer who left the United States in 2006 after finding out his Columbian husband could not stay in the country. His passion for sports helped him through the experience, and he has now found himself back in the States, still blown away that some professional athletes are backing marriage equality. He sat at the bar in the Halcyon coffee shop in downtown Austin, Texas, with two glasses of wine to calm his nerves. Red wine — possibly pinot noir, if he remembers correctly. This self-labeled “exotic creature” was writing the piece that could define him, as well as his career. He was ready to come out to the world as a gay sports writer. “I’d been ready to write that for, I don’t know, five years, six years, maybe 10,” said Chuck Culpepper, who currently covers international sports for the website SportsOnEarth.com. He had been at the Fourth Street coffee shop for almost four hours without making a single keystroke on the piece. At 7 p.m. he moved to the bar and ordered wine. He thought it should have been easier because he now had a vehicle for his message. That vehicle came in the form of a 225-pound, 6-foot-1-inch NFL linebacker named Brendon Ayanbadejo, who then played for the Baltimore Ravens. Ayanbadejo uses his social capital as a professional athlete to advocate for marriage equality in the United States. Culpepper thanked Ayanbadejo for his support in the Ravens’ locker room eight days before the 2013 Super Bowl, and the encounter left such an impression that the exchange became the motif of Culpepper’s coming out column titled “The Gay Super Bowl,” which was published on Feb. 7. His piece racked up 68 comments on the website, more than 2,000 Facebook likes on its first posting, and thousands of retweets. The vast majority of the comments were positive. One of the top comments is from a sports writer who wrote how Culpepper had affected him personally. However, the column was only the end result of a long struggle for Culpepper. Discrimination forced him to leave the U.S in 2006. That year Culpepper and his Columbian husband Alfonso knew they couldn’t stay in New York. At that time the U.S. had no provision to allow a long-term partner to reside in the country. So, the pair applied for visas in the United Kingdom. Culpepper was accepted and Alfonso was legally allowed there to come along as family. 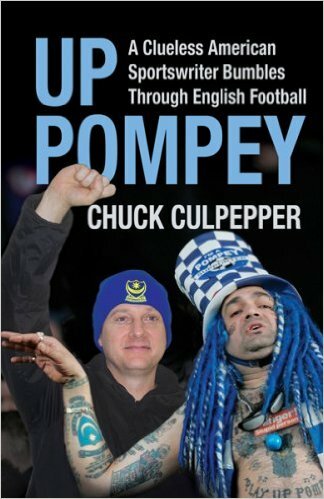 While in London, Culpepper wrote a book about an English soccer team and covered European sports on a contract with the Los Angeles Times. His journey through sports led him on adventure after adventure through the pain and suffering. After four years of living in a “walk-in-closet sized” apartment in London, Culpepper moved to Abu Dhabi, the capital of the United Arab Emirates, in 2010. So he waited even longer. Culpepper moved back to the states in August 2012. He had an interview in New York for his current job at Sports on Earth upon his return. He was now just waiting for his moment. And that moment came when he stepped into the Ravens’ locker room eight days before the Super Bowl. “So it all just sort of came together, surprisingly, at that moment,” said Culpepper, now 51. In his column he goes into detail about the event. He had forgotten Ayanbadejo was on the team until he saw his locker. He started an interview with professional football questions, but right before the linebacker walked down the tunnel Culpepper said something because he knew he would regret it for a long time if he didn’t. Culpepper had ridden to that game with Steve Buckley, a gay sports writer in Boston, who had written his coming out column in January 2011. Buckley talked with Culpepper about what a great experience his column had been. “It was really happenstance that that was the friend I happened to be around at that time,” Culpepper said. Back in Austin a few days later, Culpepper left Halcyon after finishing his column at 10 p.m. He was renting a room in a house from retired food editor Amy Culbertson and he got her help editing the piece until 3 a.m.
“To me it was a real honor and a gift to be involved in this somehow not only for a personal friend who I have loved and admired for many years but also because in a sense it is a little historic,” Culbertson said. She remembered that the beginning was the hardest part, and the pair worked on it for almost two hours. Culpepper recalled being surprised he fell asleep from about 4 a.m. to 10:30 a.m. He woke up to emails from his boss in New York saying the piece was going up in 15 minutes, a warning he didn’t usually give. The support rushed in almost immediately. Almost 100 sports writers who are his friends reached out to him in less than an hour. “It just absolutely blew me away, even though I knew the reactions would be mostly positive,” he said. He added that the only negative comments he got were from people saying they were tired of hearing about the gay community, which also left him stunned when he compared it to the country he left back in 2006. To this day Culpepper said there are still groups of people or friends who talk about it openly and genuinely with him and others that who don’t bring it up. Through this entire journey from exile to gushing support a passion saw him through — a passion for sports that had developed by the age of 8. He said this passion is what allowed him to tell his story. He watched everything: college basketball, the NFL, all of it. He would keep score, collecting huge notebooks of seasons of sports with newspaper clippings in them. He remembered having his dad keep score for him once while he went outside to do something, only to not like that a portion of the handwriting was not his. When he was 14 a neighbor told someone at The Virginian-Pilot, the daily newspaper in Norfolk, Va., about Culpepper’s budding interests. He was soon writing updates on the little league games. He later wrote for his college newspaper at the University of Virginia. Shane Whalley, of the Gender and Sexuality Center at the University of Texas at Austin, said that expectations of masculinity can be skewed in sports and cause gay men to have trouble coming out around sports. These perceptions can be even more intense in places like the locker room, Whalley said. “Another reason you hear for why athletes don’t come out sooner is because they want to be known as Jenny the five-time Wimbledon winner, not Jenny the lesbian tennis player,” Whalley said. When it comes to a sports writer like Culpepper, Whalley said many parallels can be drawn and sports writers can find themselves in similar situations, such as the locker room, and face the same issues with coming out as an athlete would. “Stereotypes unfortunately persist and some people think anyone who is supposed to be an expert on sports isn’t as credible if they’re gay,” Whalley said. Since the publication of his coming out column, Culpepper has written about the issue several more times and still travels the world covering sports, although he technically resides in Austin. While abroad, Culpepper’s position was as a reporter and not a columnist so there was no avenue for him to write this column. He did have opportunities before he left the U.S. in 2006 but thinks the outcome would have been different. He also said people each have their own time when they feel ready to tell the world their story. Culpepper said he never feared that coming out would define him and his career. In fact, he would have welcomed it.